Disclaimer: Please note two important points: 1. Only 7% of the Indian workforce is white-collar while a staggering 93% is blue-collar. The jobs in India series is an assessment of white-collar profession alone. 2. The data analyzed in this article is only reflective of the jobs publicly disclosed and industry specific recruiter-search on Credait.com. This does not take referrals into account. On average, referral hiring ranges from 3 – 8% of total on-boarding annually. 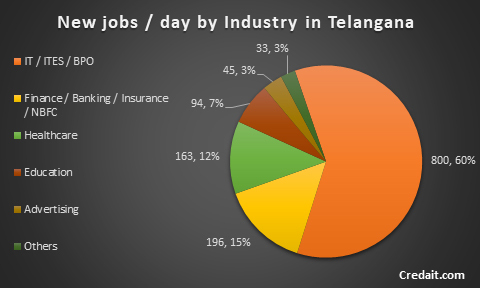 Jobs in IT, Banking and Healthcare sectors account for a staggering 80% of the professional jobs market in Telangana. What is unique in our finding is that unlike trends in other states, education and advertising jobs are the next major sectors in Telangana. It is to be noted that more than 60% of Telangana population resides in the rural sector and most of this segment in engaged in the agriculture, followed by textiles and mining with a high blue-collar workforce and negligible white collar requirements. The sector-wise breakup is depicted in the chart below. The job type break-up in Telangana is disclosed below. 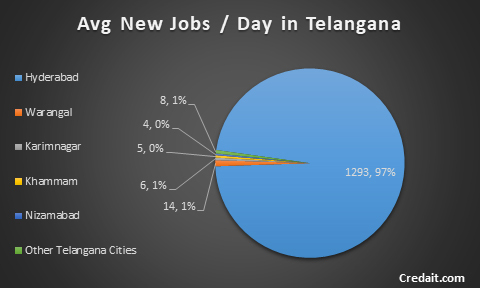 The share of job types in Telangana is depicted in the pie chart below. Hyderabad is the most desired work destination for white-collar professionals given the lowest cost of living among all major metros in India. Some of the HR staff we interviewed indicated that many white collar professionals are settling down in Hyderabad owing to financially affordable housing. According to HR staff in those companies that have branches across all major cities, those in Hyderabad have greater percentage of employees requesting employment letters on bank’s request, as a formality for housing loan. Telangana has also emerged as one of the best state in India for ease of doing business, along with Andhra Pradesh. Clearly, this has attracted even more multinational companies in setting bases in Hyderabad, which include the likes of Google, Amazon, and Apple setting up their biggest development centres following the United States of America. With the formation of the Information Technology Investment Region (ITIR), more than 15 Lakhs (1.5 million) jobs are expected to be created over the next few years in Hyderabad. The state government has also announced the formation of Pharma City to attract global pharmaceutical companies to Hyderabad for drug research, development and mass production. In terms of jobs related to IT, Banking and Healthcare sectors, the city of Hyderabad will witness greater demand for highly skilled professionals over the next 5 years. Lastly, the service sector across all industries is where the majority of work demand will be. While technology is increasingly automating repetitive work, it indirectly creates service specific jobs. While part-time work requirements are only at 10% of the total job requirements, one can expect it to reach 25-30% over the next 5 years in Telangana. Given the advent of smart cities and AI applications, people with specialized skills will transition to multiple part-time engagements for their career growth.